Sacramento, California - Brownie Girl Scout Troop 2367 from Dixon, California had a special guest at a recent troop meeting. 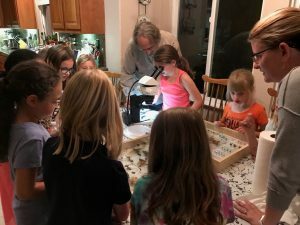 Senior Insect Biosystematist and Lepidopterist, Dr. Marc Epstein from CDFA’s Plant Pest Diagnostics Lab in Sacramento made a special visit to help teach the girls about insects. During his visit, Dr. Epstein shared with the girls how he became interested in insects and what it means to be an Entomologist. He also showed them a video presentation of live insects flying, eating, walking and metamorphosing, explaining that not all insects are pests, some are beneficial. Dr. Epstein also brought specimen cases of flies, beetles, and butterflies from the CDFA’s insect collection to show their beauty and diversity. A dissecting teaching microscope was set up for the girls to view the colorful scales that comprise the wings of butterflies. For many of the girls, it was their first time looking through a microscope. After learning about the patterns and colorings on different larvae species, the girls were inspired to paint and craft their own caterpillars out of cardboard egg cartons. During the meeting, the Brownies were able to complete all their requirements for the “Bugs” skill badge. This badge, along with the First Aid, Hiker and Cabin Camper badges are all requirements of the Outdoor Journey series the Brownie troop is currently working on. This journey has allowed the girls the opportunity to get outside and explore nature with fun, safe activities that help build essential outdoor skills and inspire the girls to become environmental stewards. The final part of the journey requires the girls to plan and execute a sustainable Take Action community project. There is already “buzz” among the troop to focus their project on something related to insects! The Brownie troop is comprised of ten energetic third-grade girls from various elementary schools in Dixon. One of the Co-Leaders of the troop is Dr. Suzanne Rooney Latham, a Senior Plant Pathologist at CDFA PPC.